My wife was in the mood for something sweet the other night and kept bugging me to help her create a vanilla ice-cream sandwich treat for the summer. I got to work making the cookie base for the vanilla ice-cream sandwich which wasn’t easy and took me a few tries. The tender cookies don’t take long to make however it’s the batter consistency that you need to watch out for. The cookie batter should look frothy and not dense. When I eat an ice-cream sandwich I don’t want to have a hard cookie base. You expect to bite into an ice-cream sandwich where your teeth sink through the soft cookie, into the ice-cream and again through another cookie. I am not a fan of the ice-cream sandwich with the hard cookie as I find the ice-cream squashes out too easily and a big mess is born. Don’t get me wrong they taste good and I wouldn’t turn one down but for my wife I knew that being on a low-carb diet that most cookies that we create do come out of the oven moist. The reason for the moist cookie is because we aren’t using all-purpose flour, rather we use coconut flour, flax-seed and protein powder. With coconut flour you need to be cautious as it soaks up moisture like a mushroom. If you use too much you will have a dry cookie that falls apart. Never ever over-bake any cookie or it will be hard as a rock. I’d rather under-bake it and let it cook on the baking sheet. Since we don’t use granulated sugar in any low-carb recipes that we create we substitute with Stevia Erythritol which sweetens without the calories. I have a coffee grinder so I powder up what I need when I bake. It is a natural product that tastes and looks just like sugar with no side-effects like some other sweeteners cause. The only downfall is that it can be a bit pricey. It is available at the Bulk Barn in Canada. These particular cookies are a flavoured Almond Coffee Base cookie which I’m telling you is amazing. It pairs so nice with the homemade ice-cream that it’s hard to not go back to grab another one. My wife ended up dividing the batch 2 for her and 2 for me. This recipe makes 6 large cookies which I shaped by hand to get them as square as I could. Once the cookies were cool and filled with ice-cream I trimmed them so they would be square like a traditional vanilla ice-cream sandwich. The extra trimmings were put in a bowl with a couple of scoops of the ice-cream. That didn’t last long as my wife was purring with delight. She said it was the best treat she’s eaten in a long while. YES!! I like to think of myself as pretty good in the kitchen however when it comes to creating no-churn vanilla ket0 Ice-cream I thought I better check in with the pros. The homemade no-churn vanilla keto ice-cream recipe which is low-carb/primal that I used was adapted from a recipe Martina created over at The Keto Diet Blog. Honestly, I was a bit reluctant to make it on my own because I didn’t have the time to mess up and learn from my mistakes and the ingredients are pricey. So, unless you know what you are doing with ice-cream making especially when it involves raw eggs leave it to someone who has tested it to perfection. One look at Martina’s ice-cream and you will be drooling and let me tell you it tastes as good as it looks. Below are the ingredients you will need to make her homemade no-churn vanilla keto ice-cream. Click the link to get the full instructions for the recipe including step by step photos. It’s easy to make. I had about 2-3 cups leftover after filling the vanilla ice-cream sandwiches so I just froze it and the wife ate it for dessert. In each sandwich I put 3 small ice-cream scoops in each cookie equal to 1/2 cup or approximately 1.2 net carbs. The scoop was a bit bigger than a melon ball scoop. 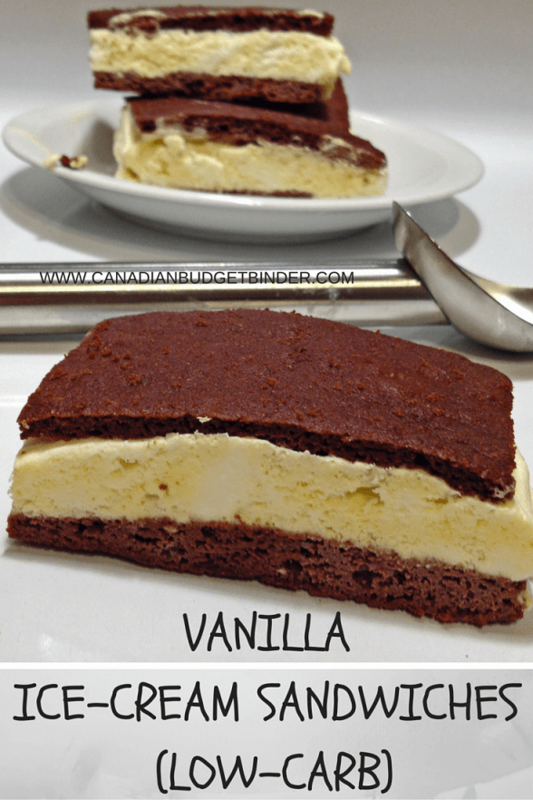 For every 2 scoops or 1 cup the net carbs are 2.3 grams which is pretty good for this recipe considering we don’t use 2 scoops in each vanilla ice-cream sandwich. I left the ice-cream in the freezer for 3 hours before I pulled it out to see if I could scoop it onto a cookie. I didn’t want it to be too soft or too hard, but just right. Keep in mind once you wrap the vanilla ice-cream sandwiches in parchment paper or wax paper to freeze them individually they will harden up again which is what you want. Before you eat one take it out and let it sit for a few minutes if you like your vanilla ice-cream sandwich soft but if not tuck in right away. 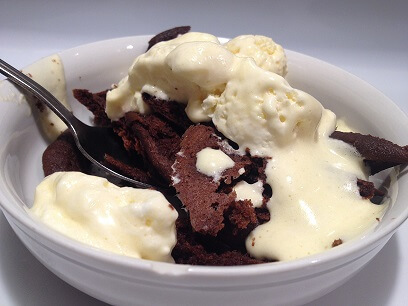 Here is a picture of the vanilla keto ice-cream that I made for this recipe. If you’re not familiar with the Keto-Diet Ruled Me explains it quite well with their Beginners Guide to the Keto Diet. 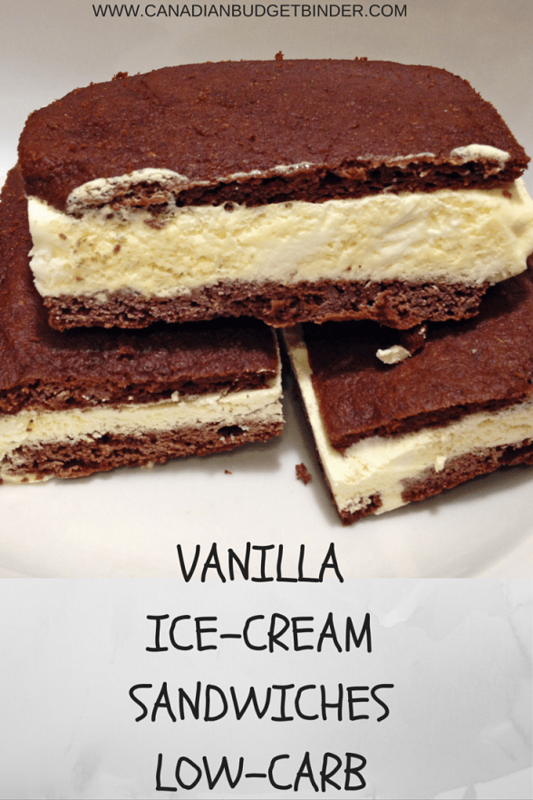 If you're in the mood for a low-carb dessert this summer try your hand at making this easy homemade vanilla ice-cream sandwich. For the No-Churn Vanilla Ice-cream see the link in the above blog post. In a microwave bowl add your peanut butter and almond butter and soften for about 15 seconds, then mix. Add in your cocoa, coconut flour, flax seed and protein powder, baking soda, baking powder and whipping cream. Take a large ice-cream scoop size amount of the batter and put it on the baking sheet. 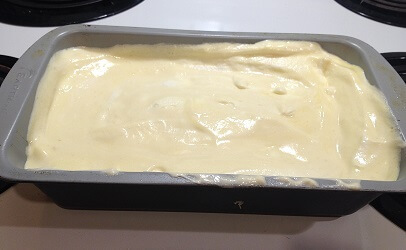 With a spatula work the batter into a square. Do this for the next 5 cookies and make sure they are all even in size and spaced out as they will grow. You want them to be a bit bigger as you will trim them to perfection when they are done. When baked remove from oven and let cool completely. Once your ice-cream has been in the freezer for 3 hours test to see if you can scoop it where it's not runny but no too hard. Add 2-3 little ice-cream scoops of the ice-cream onto one cookie, spread it so it's even and top with another cookie. Put them into the freezer immediately on a tray or in a container to freeze. I'd let them freezer for at least 2 hours. Once frozen remove the ice-cream sandwiches and trim them so they are nice and even. Don't throw out the trimmings as you can enjoy them with the leftover ice-cream you have. Any leftover ice-cream can be frozen for up to 2 days. It looks like it will be lots of work but it’s not that bad and they taste delicious. Once they are frozen you can wrap them if you like or just eat them all in one go. Ha, just kidding. Total Net Carbs Per Ice-cream Sandwich = 3.48g 2 cookies +1.2g ice-cream=4.68g net carbs in each. Keep in mind these are a fair size so you can cut them in half to make 12 or bake your sandwich cookies smaller. Your choice. Enjoy and if you like this recipe please consider leaving a comment and rating this recipe.